Sometimes recipes happen as a byproduct of life. You have plans for your day that include relaxing in the sunshine, maybe reading a book and then BOOM…you are making noodles from scratch like you are Caroline Ingalls or something. There you stand in your kitchen, covered in flour asking yourself “what just happened?”. Such are the circumstances of my first foray into making noodles from scratch. I was reading Mr. Putter and Tabby Catch the Cold and when the title character got chicken soup from his neighbor, my kids exclaimed how much they love chicken soup! I decided to make some for lunch before checking the pantry for noodles. Clearly I needed to go grocery shopping (who doesn’t have noodles!?) – but I was watching a couple extra kids and figured it would be easier to occupy them with a noodle making project than wrangle them all into the car and thru the aisles of a store. What can I say, the choice made sense in my head at the time. I hold women who manage grocery shopping with 4+ kids in VERY high regard! I don’t have a fancy pasta press, cutter, drying rack, or attachment for my Kitchen Aid. Nope. 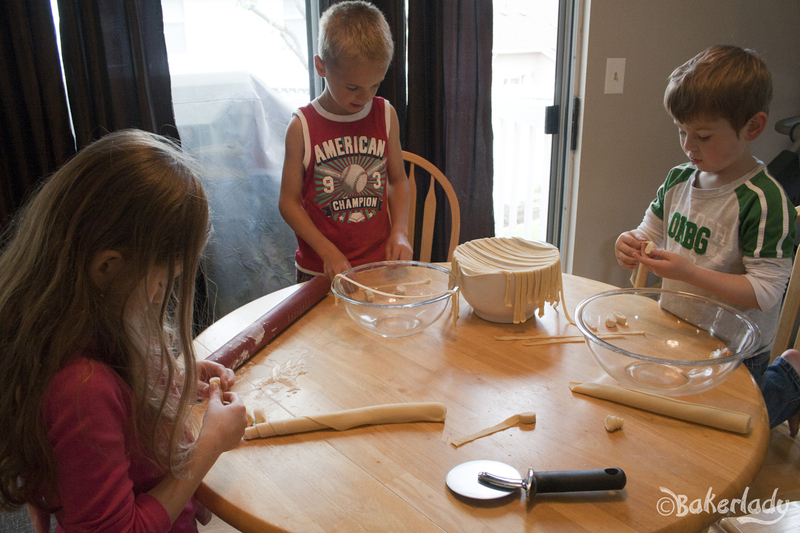 Just my hands, a rolling pin and some adorable little helpers. I’ve decided that some things appear overwhelming because they are unknown. Like noodles. They really aren’t difficult to make at all. They just seem scary. Summer is here – I highly recommend this for kiddos lolly-gagging in your house claiming boredom. 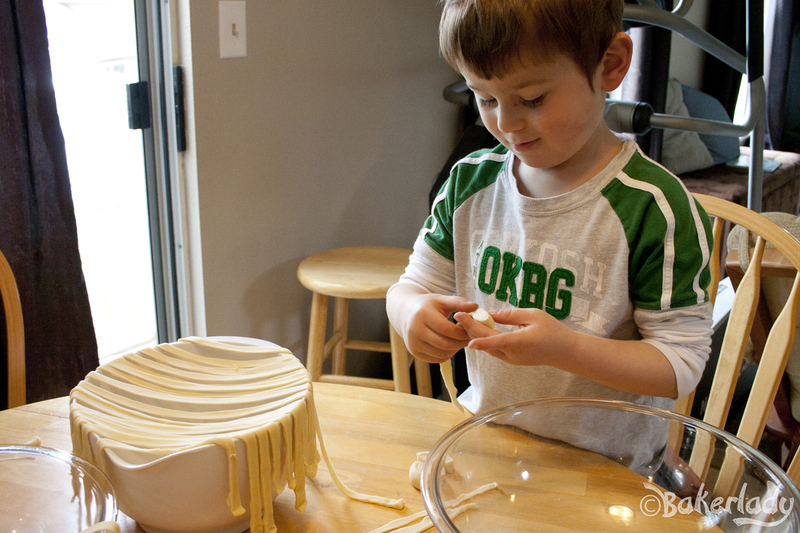 Pasta making kept two high-energy five year-old boys occupied and engaged for over an hour. 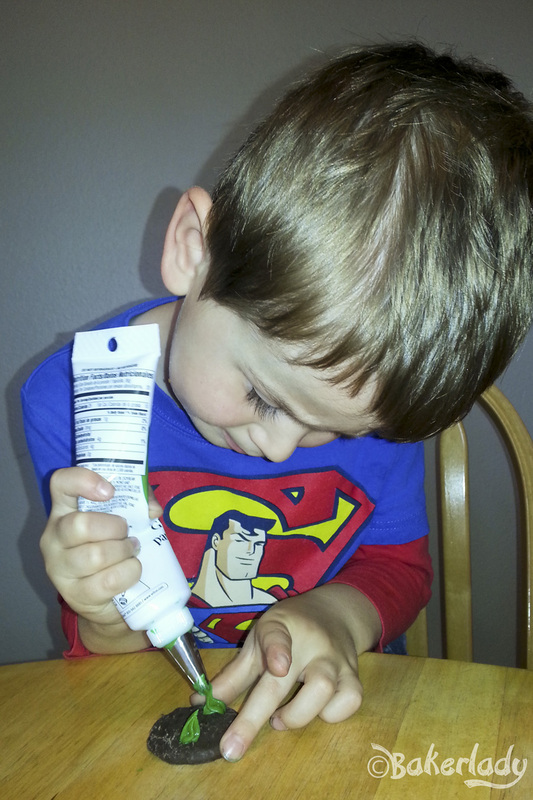 And I’m sure there’s a benefit to fine motor skills here too. A few simple ingredients in a bowl and the dough comes together lickity-split. Let it rest about 10 minutes, then roll it out nice and thin. This dough was incredibly easy to work with. No sticking, no frustration, just a nice flat canvas for our noodles. I let it air dry a few more minutes before trying a trick I remembered seeing (somewhere – no idea where) about cutting nice even noodles. Don’t cut yet. 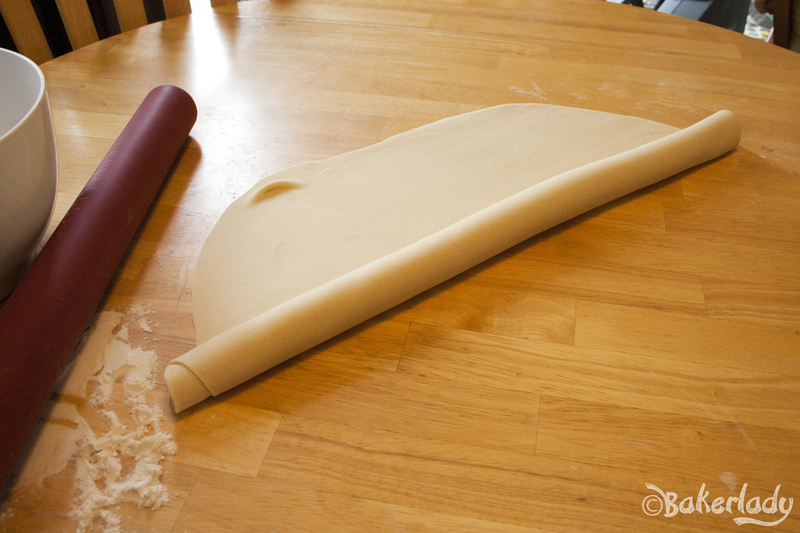 Roll your dough. Yup. That’s the trick. 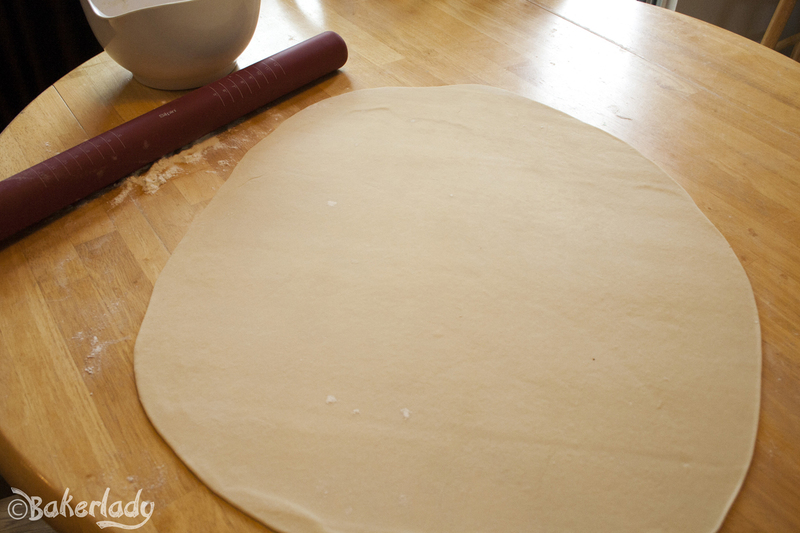 Instead of attempting to cut in a straight line thru the vast expanse of a big dough sheet, roll it up. Like so. Kind of like making cinnamon roll cookies. 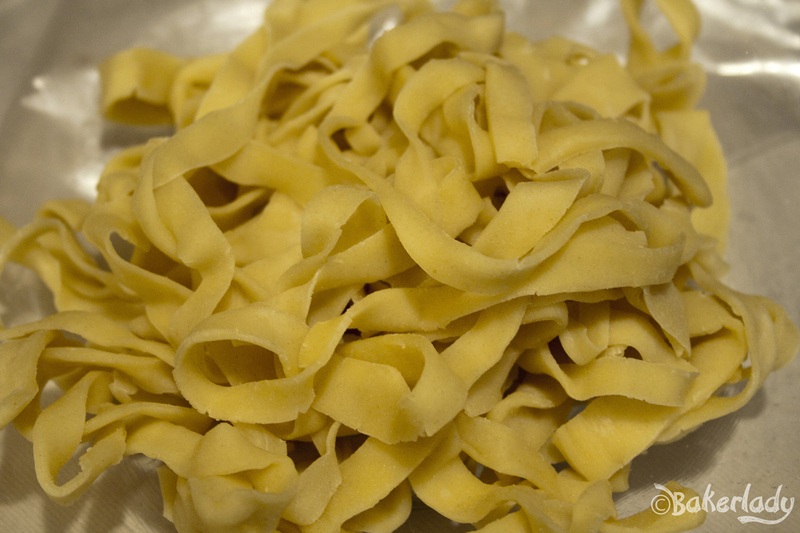 Then, cut off the end and you have a dough spiral that can just get unrolled into a perfect egg noodle. 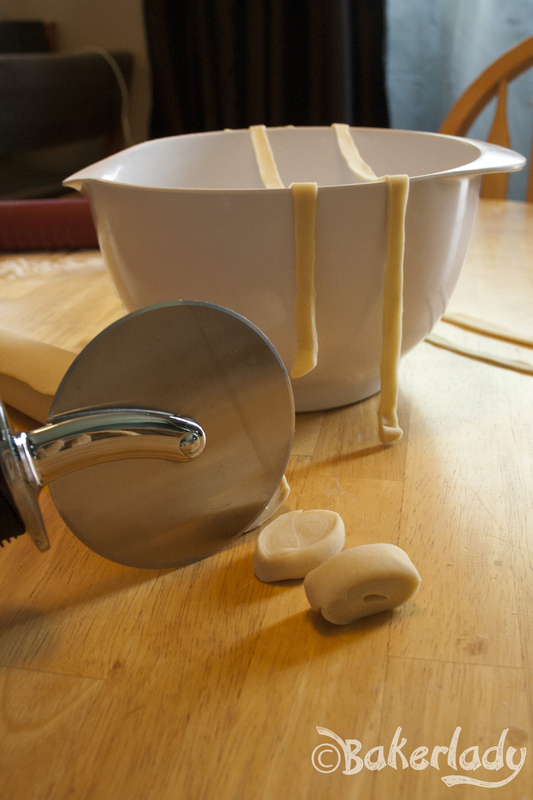 Now, you can use this dough for other kinds of noodles too. Just change the shape you cut it into and you can make ravioli, farfalle, lasagna or many other kinds of basic noodle shapes. This is where the reinforcements came in very handy. I cut little dough spirals and the munchkins unrolled them and draped them over some bowls. You can see I have two dough rolls on the table. That’s because I cut the dough in half and then rolled it up. I didn’t need noodles that were three feet long. 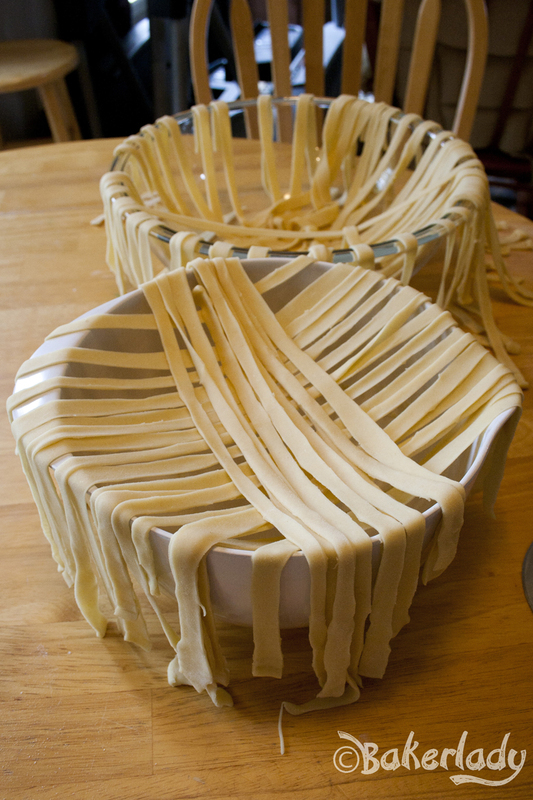 In no time at all we had used every big bowl in the house for draping noodles. 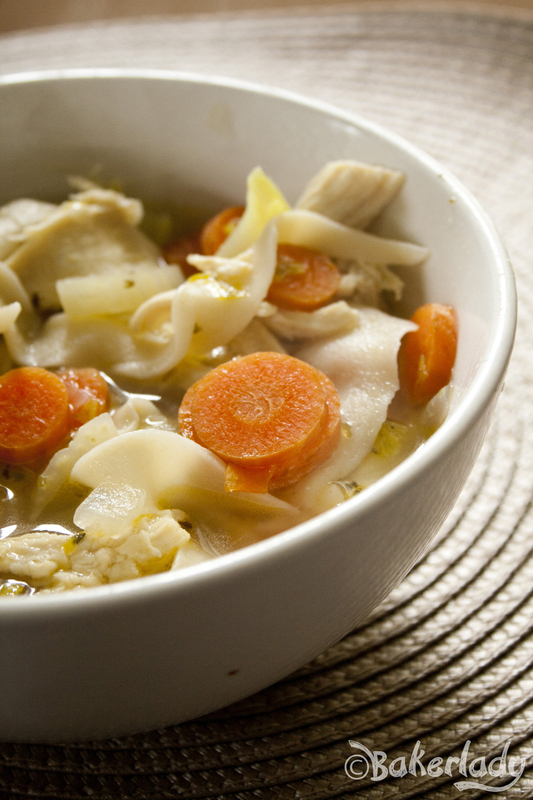 Let them dry a little while – I let them alone in the fresh air while I finished up some soup details. 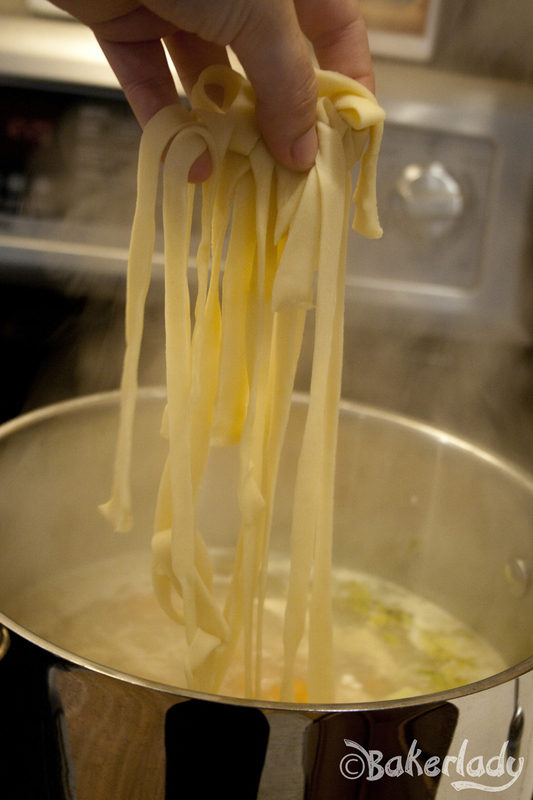 Then, just plop them into some boiling water (or in my case, soup broth) and cook until al dente. Which, for me was around 3 minutes. I didn’t use all these noodles in my soup. I saved some to see how they tasted just boiled in water with a little cheese on top. Delicious. 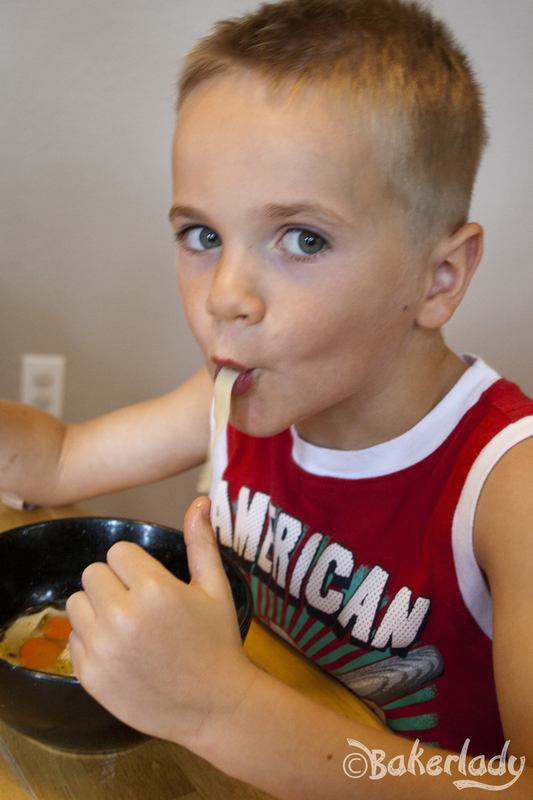 The chicken noodle soup was perfection and got thumbs up from all my little noodle slurpers. Check back for the full soup recipe in a week or so. Mmmmmm. It was gooooooood. 1. In a large bowl, stir together the flour and salt. Add the beaten egg, milk, and butter. Knead dough until smooth, about 5 minutes. Let rest in a covered bowl for 10 minutes. 2. On a floured surface, roll out to 1/8 inch thickness. Allow to rest about 10 minutes. Cut into desired lengths and shapes. 3. Allow to air dry 30 minutes before cooking. I got the idea for these adorable cookies from my friend Rachel. 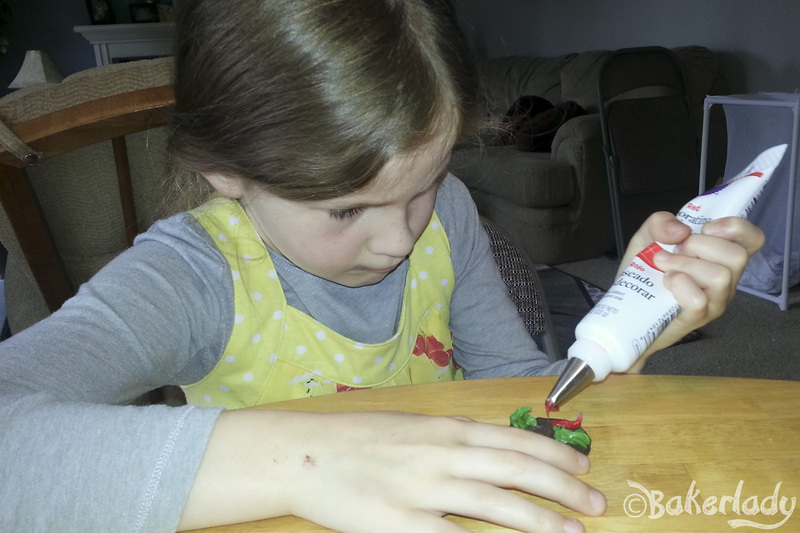 She’s always doing fun things with her girls and is just generally an awesome resource for delightful kiddo entertainment. I gave my kids a simple demo and then let them do the rest. They LOVED making (and eating!) these cookies! Easy, delicious and super cute! 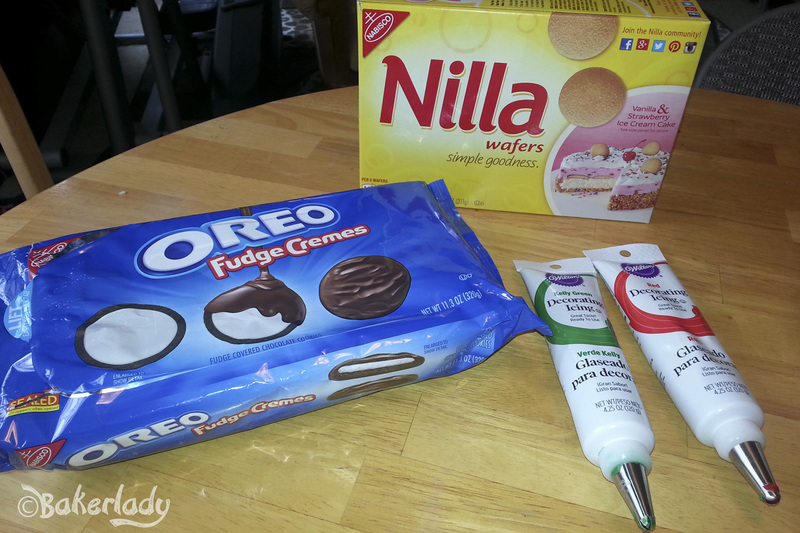 First you’ll need a box of Nilla Wafers, a package of dipped Oreos and two tubes of frosting (one red, one green). 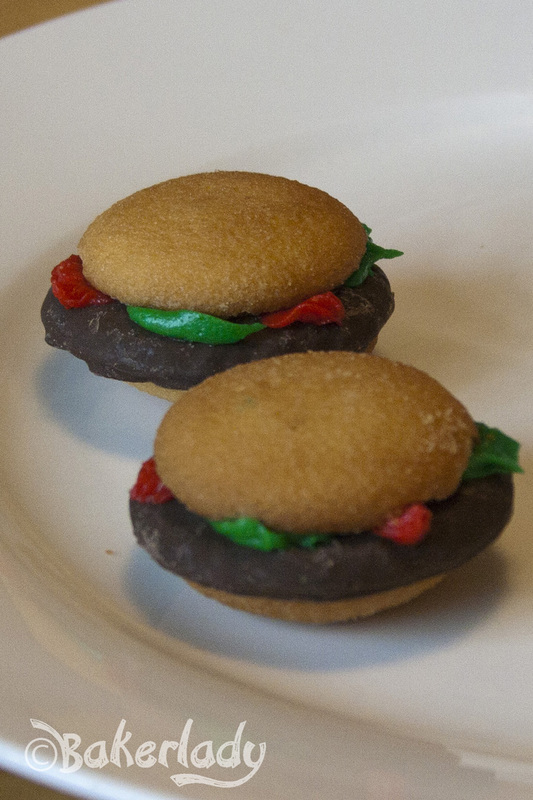 You could also use Peppermint Patties, Grasshopper Cookies or (during Girl Scout season) Thin Mints. I really liked the taste of the dipped Oreos though. Besides, not everyone likes mint…but who doesn’t LOVE Oreos? I gave each kid a frosting tube and put small star tips on the ends. One did three red ketchup swooshes, the other got to do the lettuce green swipes in between the red ones. You can also do yellow for mustard, and/or top with tinted coconut for lettuce instead of the green frosting – but each kid having a tube and assembly line simplicity worked really well for my two munchkins. Stick the Oreo together between two Nilla wafers with a little dab of frosting on the bottom. 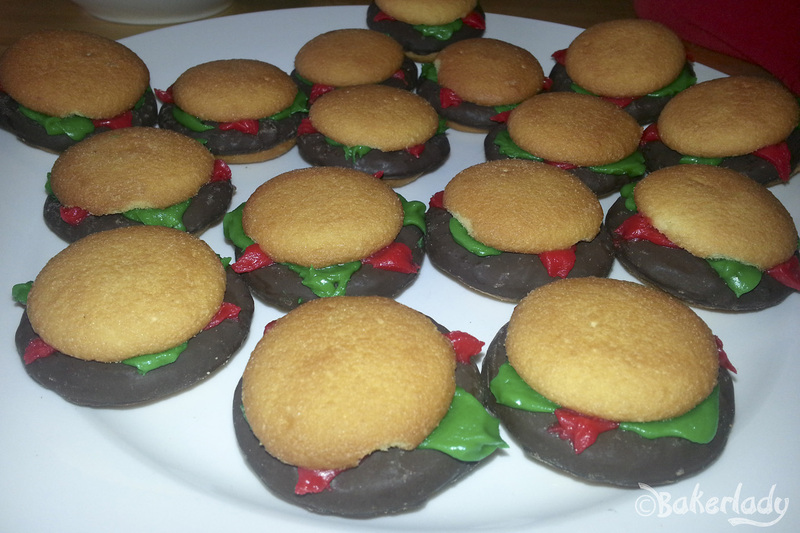 Adorable hamburger cookies for your next BBQ. The entire plate was devoured. My kids were so proud of their creations! For each burger you will need two vanilla wafers as the buns. Place a small dot of frosting on the bottom bun and then place your Oreo cookie on top to look like a hamburger patty. Make three dots of red frosting on top of the cookie to look like the tomato or ketchup, then three dots of the green frosting to look like lettuce. Finish by placing second vanilla wafer on top as the top burger bun.